One thing that was very clear about our Irish itinerary was this: we had a limited time in the country, and we wanted to see as much of it as we could. This was best illustrated on Day Four, when we left the northeast corner of Ireland for a lengthy drive to the northwest, to Donegal. Simon sat at his table, trying to write down the directions to his cottage in Donegal, a secluded little abode that seemed more and more tucked away from everything. The more turns he recorded, the more uncertain he became about our ability to reach the cottage. In the end, he resolved to just come with us. This kickstarted what my sister claims is her favorite part of the trip, the part where we acquired a knowledgeable Irish tour guide – and I got a break from driving. During a rainy hike on our first day in Donegal, Simon plucked a chunky red rock from the path and held it up: “See this? It’s red because it’s got lots of iron. Iron is good for ya, especially when you’re pregnant.” He then licked the rock and put it back in the dirt. What an understatement. He sent along a video documentary covering a year when the parade route was changed. Traditionally beginning at a Catholic town and ending in that same town, the route had been altered to avoid the Catholic town at the end of the parade. The documentary ended with the paraders violating the rule and attempting to break through the police barricades, chucking rocks and bricks at officers in riot gear. It ended by stating it had been filmed in 2013. I was happy enough to miss the parade, but the bonfires were unmissable. As we drove along, we’d occasionally see piles of wood palates rising up in the distance until we were alongside them and they looked more like mountains than piles. We came upon an especially intimidating one on a corner, and Simon reluctantly idled by the corner so we could take photographs. “Hurry,” he told us nervously. Soon, a car pulled up behind ours and Simon began shouting for us to get back in. “Look at that woman driving the car!” he cried, pointing to the rearview mirror. A tight-lipped older woman was clearly visible, pointing angrily at our car. 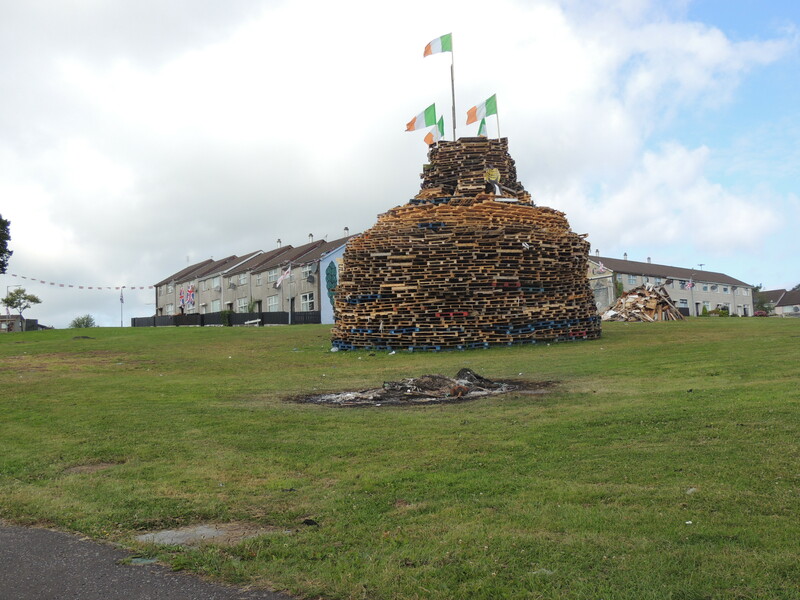 Simon was thrilled to get out of there, especially because this particular bonfire had the Irish flags mounted at the top. He did reassure us that, as tourists, we wouldn’t have gotten too much hassle, but he would not have been welcome at all. After that, I was happy to get out of Belfast. My Lonely Planet describes the rope bridge as a wobbly affair, not a top pick for those who are acrophobic. The bridge swings in the breeze as you cross between the mainland and an island, just as the fishermen did back in the day. I was actually hoping for something much longer, but the aquamarine and copper-patina colored water below was breathtaking enough for me to overlook the relative stability of the rope bridge. We took our time hiking along and photographing healthy cows that grazed along the hillsides before lingering a bit on the edges of bluffs, our feet dangling high up over the clear water. 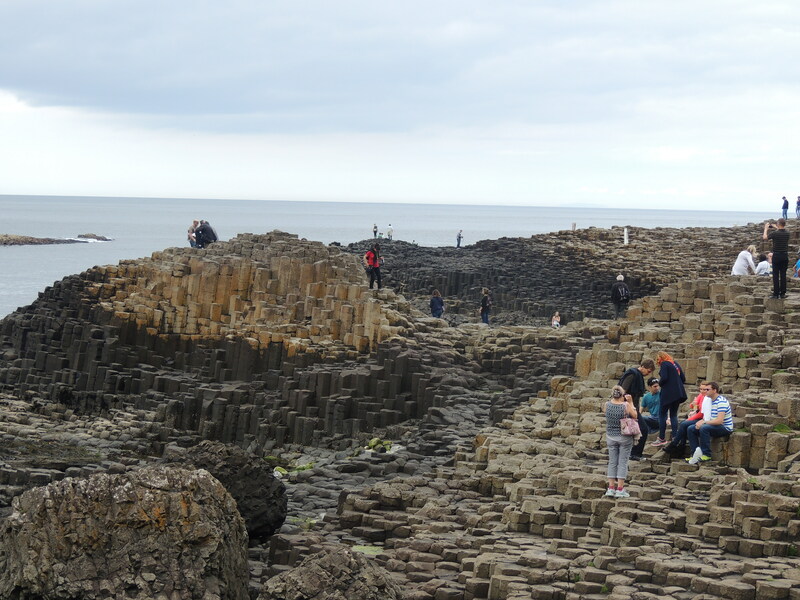 I read a tantalizing excerpt from Lonely Planet arguing otherwise, that the hexagonal stones and their step-like formations were something otherworldly, surely the work of Finn MacCool, famed mythological Irish giant. The Lonely Planet did mention that it only costs money to park, so after arguing that Simon would only be dropping us off, we skipped in cost-free. When eventually we stumbled on it, we felt slightly disheartened that Simon was right. “This doesn’t look anything like the photos,” Kacey remarked, and she was right. Our travel guide had included surreal photographs of the stones, draped in a crawling mist, the rose-hued sunrise tickling the water just beyond. Smooth and untouched, the stones climbed like perfectly shaped chimneys toward the firmaments. In reality, the stacked stones were cluttered with tourists. It was impossible to snap a picture without someone being in it. People sat atop them, climbed them, wedged themselves between them, and were generally part of the causeway themselves. 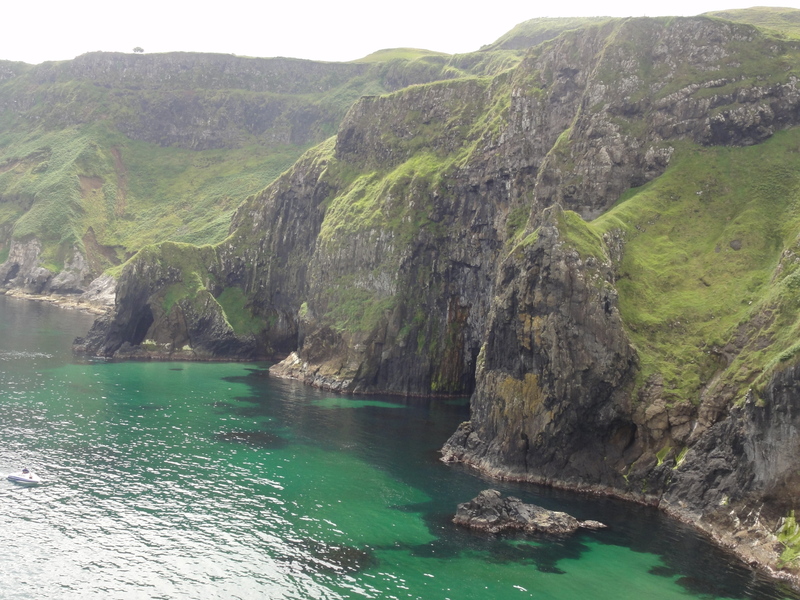 The mist-shrouded denizens of the Antrim Coast were, as Simon had described, piles of rocks. Disappointed, we retreated to the car, but were too proud to admit to Simon that he was right – at first, anyway. “Well? What did I tell you?” he asked triumphantly. “That was…the best thing we’ve done so far,” Kacey said. “Yeah, he was moving the stones to show how the causeway got there!” I pitched in. “They were pouring lava in the water to show how the stones were formed,” Allison added. I thought that this comment would have surely outed us, but Simon was aghast. “Yeah, they had some kind of reenactment going on,” I told him. We finally admitted that he had been right, that no, it wasn’t anything especially breathtaking – only because he seemed so shocked and incredulous that we felt a little bad. A little farther up the coast road is Bushmills, the famous whiskey distillery that is not Jamiesons. While we had been picking our way through throngs of tourists at the causeway, Simon had driven to Bushmills to inquire about a tour of the distillery. Unlike the Guinness Factory, which is more of a museum, Bushmills is a working distillery, meaning you can actually pass through rooms where people are in the process of distilling whiskey. Pretty cool. Unfortunately, everyone was off because July 11 is a holiday in Northern Ireland, so the tour would essentially bring us through an empty distillery. 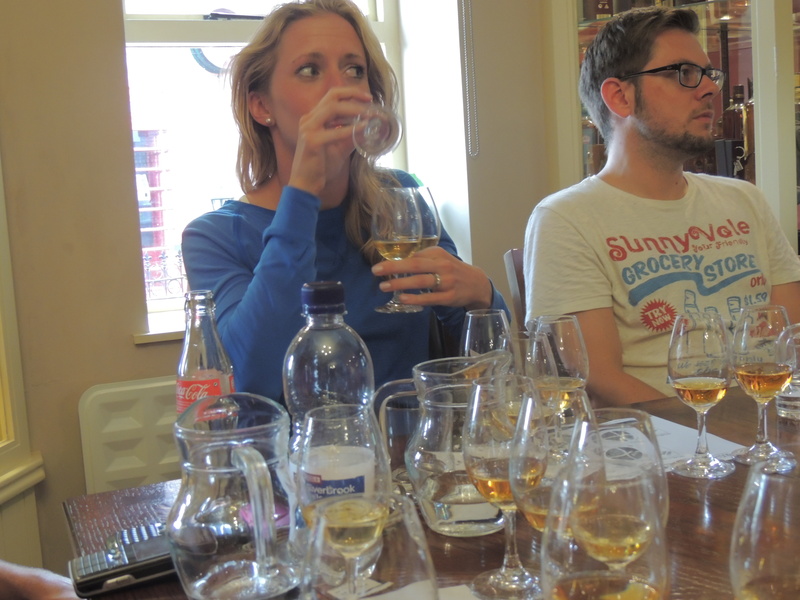 Fortunately, there was a whiskey tasting we could participate in. Simon had found all of this out for us, so by the time we got to Bushmills, we had already decided that a whiskey tasting would do the trick. The tasting offered six different types of whiskey – or so it said – and was a cozy affair, open only to eight lucky whiskey-lovers. Once inside, we realized two fallacies: first, it was open to far more than eight. The eight-person wooden table set with whiskey glasses was already full, and we had to stop after the first glass to admit eight more people, who all crowded into the couch area of the room. Second, we were given ten glasses of whiskey, not six. And I’m not talking shots, here. I’m talking arbitrarily filled glasses of whiskey, and ten of them. While this didn’t seem a great idea on its own, it sounded especially ill-omened before a surfing lesson, which we’d scheduled after the whiskey tasting. The three of us delicately sipped the whiskey, leaving much in the glass, much to our tablemates’ chagrin. Kacey ended up passing all of her glasses to the older man beside her, who consumed his share as well as hers and grew redder and sweatier as the tasting went on. For his part, I don’t think he would’ve cared what she said, since she was supplying him with extra alcohol. At the end, we received certificates at the bar for basically being able to stand up after the tasting, much to Simon’s disappointment. “I thought I’d get to carry you all out of here!” he lamented. A little buzzed – and definitely nice and warm – we headed off to our last stop of the day: a surf lesson. Why is my board so small? Despite growing up by the beach, Kacey, Allison, and I had never tried surfing. What’s worse, Kacey’s boyfriend is a surfer and Allison and I have two cousins who often travel to various islands to surf. 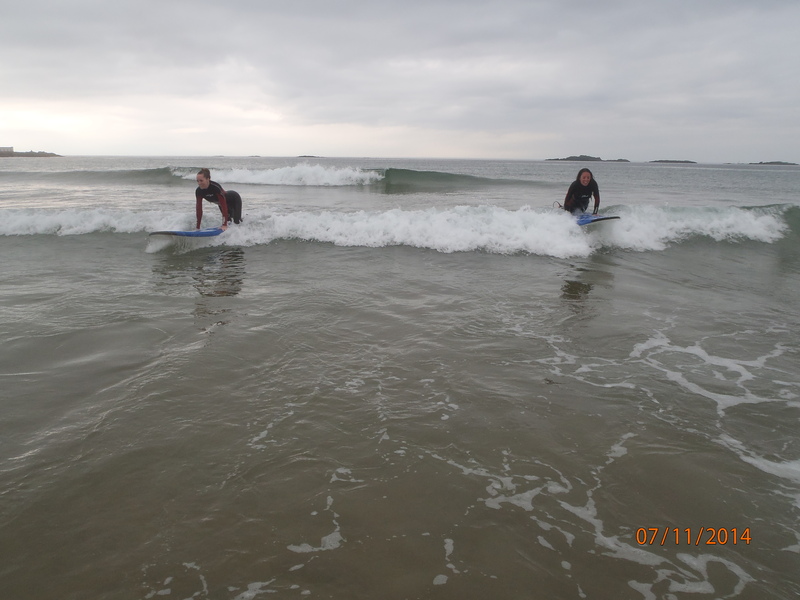 We approached our first surf experience mildly intoxicated from the whiskey and with zeal. It was a cold afternoon with grey skies and choppy water, but Simon had phoned his brother Jono, who gives surfing lessons, and had arranged for a free lesson for the three of us. 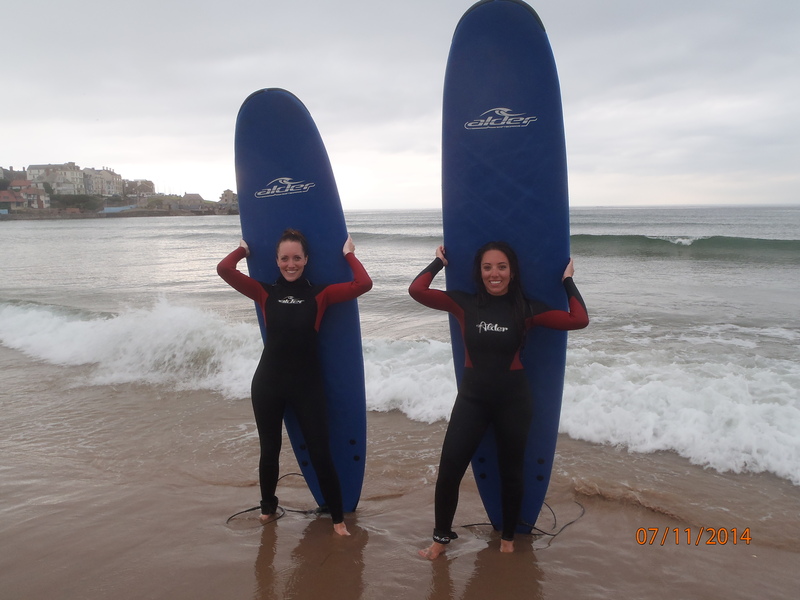 Allison and I opted for surfing lessons and zipped up in men’s wetsuits while Kacey chose a SUP option. The wetsuits were effective: within minutes of getting in the water, I couldn’t feel the cold, even on my bare feet. Allison caught on quickly, catching two waves almost immediately. It took me a little longer, but eventually I got all parts of the equation to work and rode a wave – and then another! And that was it. Surfing is much like golf: there are a number of elements to remember, and you have to get them all to connect at the same time in order to succeed. If one thing is off, you miss out. Paddle when the wave is coming, time it correctly, jump up on the board, keep your knees bent, keep your head up the entire time. Still, it was loads of fun, and Kacey joined us on the boards later, as we prepared to peel off the wetsuits and move on. Last wave of the day…I think we were tired. Jono invited us for dinner, and we’d been told that fish and chips were a must-try in Ireland. Kacey, Allison, and I visited a stand on the road and bought some, only to find that the fish was really dry. Sadly, it put us off from the meal permanently, at least for now. 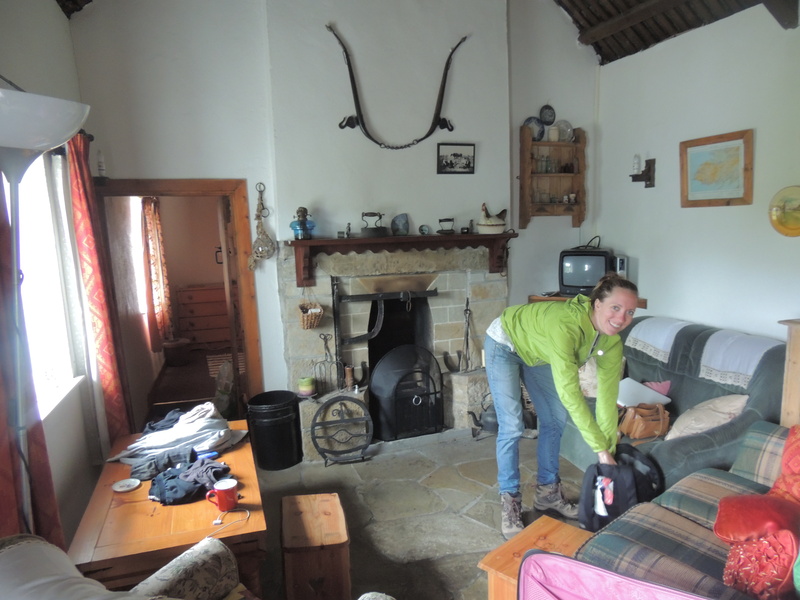 We arrived at the cottage in Donegal much later than we anticipated, pulling in around midnight. I’m glad Simon drove us, as it would have been difficult to find in the night, a lone sentinel way out at the end of a peninsula, in a town whose population is a staggering 25. Simon’s parents had started a fire for us, so when we entered, the living room was ablaze with a warm, bright fire. Perhaps the sensible thing would’ve been to go to sleep, but we’d bought two bottles of red wine and were completely dazzled by our lodging for the night. Built in the late 1800s, Simon’s cottage was as authentically Irish as you could get. The next day, when we visited a folk museum that featured Irish cottages from various time periods, we strolled into one that was laid out exactly like Simon’s. Simon had also told me ages ago that his cottage was haunted. “Guests who stay here often say they feel something,” he told me eerily. His mother, on the other hand, was quick to dispel this myth. Inside the cottage. Note the old time fire tools. That may have been true, but in the dark of midnight, there was almost certainly a ghost – and it lived in the upstairs bedroom. For this reason, the three of us claimed a queen-sized bed in the downstairs bedroom. Until three, we sat up drinking wine, adding logs and peat to the fire, and listening to Simon’s tales of ghosts, hitchhikers, and the little folk. Appropriately, we slept until nearly three in the afternoon the following day. I have a number of top experiences from our Ireland trip, but I think this day – and especially its ending in the Irish cottage – might trump all else.